Magnetron sputtering is a physical vapor deposition method that allows the deposition of various materials, including metals, oxides, ceramics and etc. by using a specially formed magnetic field applied to a diode sputtering target. The deposition rate, or the film formation rate, is an important parameter that measures the effectiveness of the magnetron sputtering machine. There are several influencing factors of the deposition rate, including the type of the ambient air, the working pressure, the temperature of the sputtering target, the strength of the magnetic field, and so on. 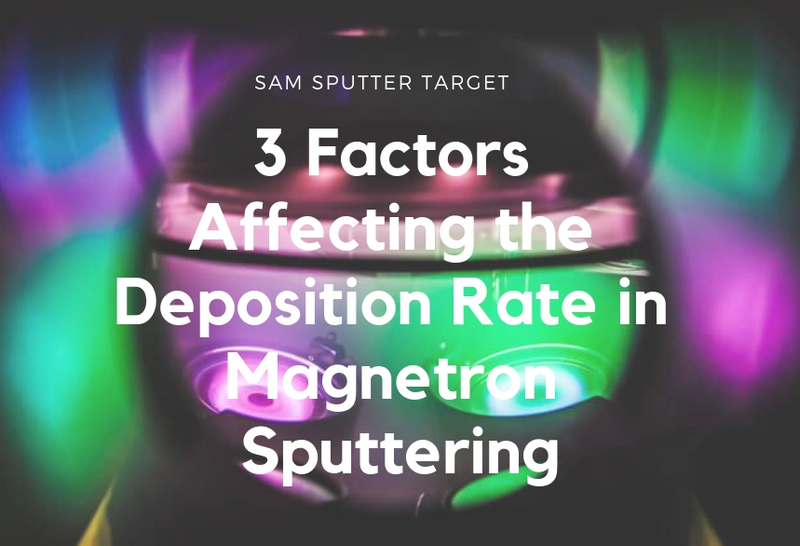 But today, we’re going to talk about the 3 important factors affecting the deposition rate in magnetron sputtering: the sputtering voltage, current and power. The sputtering current of the magnetron target is in direct proportion to the ion current of the surface of the sputtering target, so it is also an important factor that affects the sputtering rate. There is a common law of magnetron sputtering that the deposition rate is fastest under the optimum gas pressure (according to different sputtering targets and different sputtering projects). Therefore, on the premise that the film quality won’t be affected and the customer’s requirements can be satisfied, it is appropriate to consider the optimum value of the gas pressure from the sputtering yield. There are two ways to change the sputtering current: change the working voltage or change the working gas pressure. The effect of the sputtering power on the deposition rate is similar to the sputtering voltage. In general, increasing the sputtering power of the magnetron target can increase the film formation rate. This is, though, not a universal rule. In the case that the sputtering voltage of the magnetron target is low (for instance, around 200 volts) and the sputtering current is high, although the average sputtering power is not low, the ions cannot be sputtered and cannot be deposited. The prerequisite is that the sputtering voltage applied to the magnetron target is require to be sufficiently high so that the energy of the working gas ions in the electric field between the cathode and the anode is sufficiently greater than the “sputtering energy threshold” of the target. From the above discussion, you can see that voltage, current and power actually interact with each other. The deposition rate in magnetron sputtering is never affected by one of them but all of them. Want to know the best parameters of these three factors for your project? Please send us an inquiry. The experienced team from Stanford Advanced Materials will give you a satisfactory solution for your project. Stanford Advanced Materials, a global sputter coating manufacturer since 1994. Please visit https://www.sputtertargets.net/ for more information.